The first Tolkien movie trilogy, part 2: The Lord of the Rings (1978) | 'TAIN'T THE MEAT… IT'S THE HUMANITY! After the success of The Hobbit TV special of 1977, Tolkien fans didn’t have to wait long for the next Middle-earth adaption – less than a year in fact. 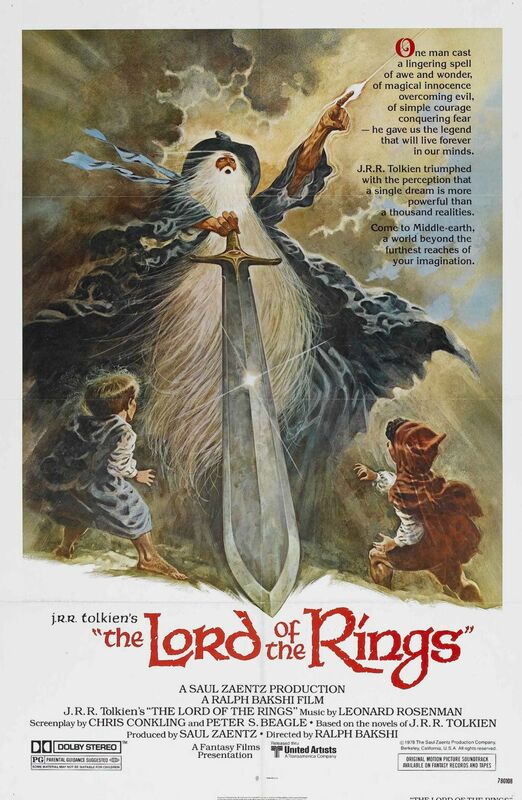 On 15th November 1978 the first attempt to translate JRR Tolkien’s most famous work to the big-screen was released: director Ralph Bakshi’s ambitious The Lord of the Rings. Typical for such a high-profile project, The Lord of the Rings’ journey to the silver screen wasn’t a straight forward one. The film rights were owned by United Artists, who had planned an adaption with Stanley Kubrick (Spartacus, 2001: A Space Odyssey) in the late 1960’s. When that fell through John Boorman (Point Blank, Deliverance) was hired to write the screenplay and direct, with the director planning to distill all three novels into one film. Eventually the film would prove too costly and Boorman left the project, although some of the themes he developed would eventually be incorporated into his epic retelling of the Arthurian legend, Excalibur (1981). 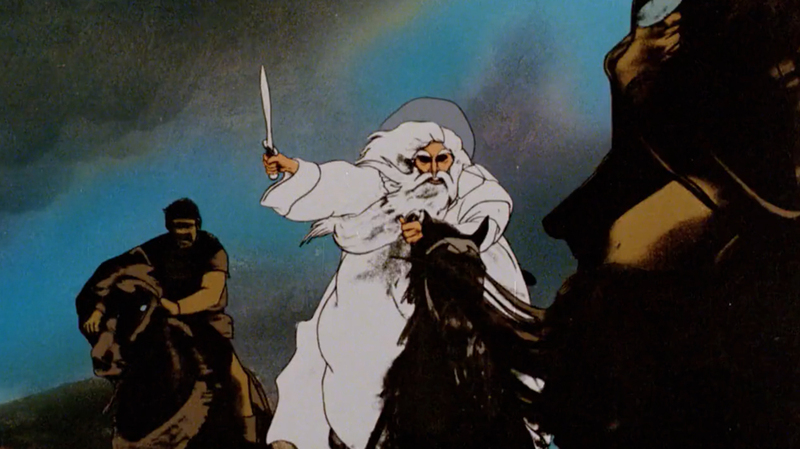 Independent film maker Ralph Bakshi, believing that only a three movie adaption would do justice to Tolkien’s story, convinced MGM President Dan Melnick to purchase the rights from UA. After a few set-backs (brought about by MGM firing Melnick) Bakshi entered into a deal with producer Saul Zaentz (One Flew Over the Cuckoo’s Nest, Amadeus) to direct the film. 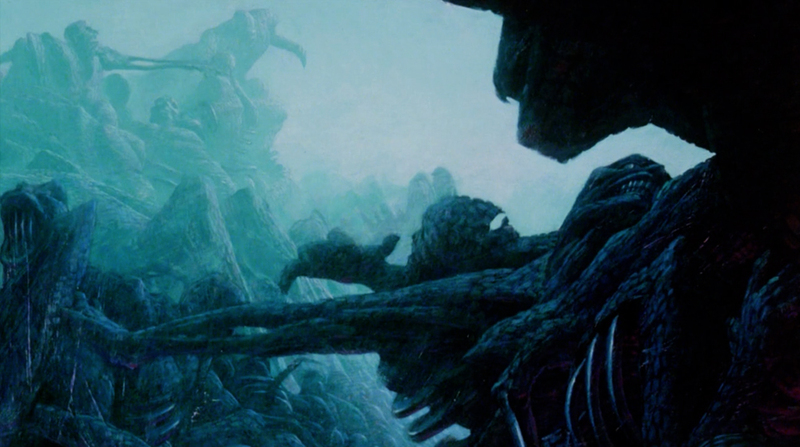 At first glance Bakshi wasn’t a natural choice to shepherd Tolkien’s beloved fantasy to the screen. Bakshi began his career working as a cell painter for Terrytoons, producers of Deputy Dawg and Mighty Mouse, before branching out on his own to direct his debut animated film, the X-certificate Fritz The Cat in 1972. The film would be hugely successful and he followed it with other adult-orientated films Heavy Traffic (1973) and Coonskin (1975), as well the PG rated fantasy Wizards (1977). A fan of Tolkien from his youth Bakshi was determined to remain as faithful to the original story as possible but he quickly realised the cost of adapting the story into three films would prove prohibitive, so the decision was made to spread the story across two instead. The first film (titled The Lord of The Rings, part one) would cover events from the first volume of Tolkien’s story, The Fellowship of the Ring, up to the battle of Helm’s Deep from the second volume, The Two Towers. Once the first film was completed work would then start on the second part which would adapt the rest of The Two Towers and the third volume, The Return of the King. Even by splitting the story into two films Bakshi, with a budget of around $8m to work with, was faced with some critical creative decisions. He wanted the film to have a mature visual sensibility (publicity for the film called it ‘the first movie painting’) and not feel like a standard cartoon, so he utilised a technique he had used previously on his films – rotoscoping. Rotoscoping is a procedure that involves shooting live-action sequences and then tracing over the individual stills to create animated cells. Use of this technique gives the animation a very fluid and realistic feel, exactly the effect Bakshi was after. He first directed the whole film as live action (shooting mainly in Spain) and then produced rotoscoped animation from the footage with very little traditional cell animation finding its way into the film. He also utilised analogue optical effects, most noticeably when Gandalf battles Aruman (Sarumen’s name was changed to avoid any confusion with the film’s antagonist Sauron – a daft decision) and when the Ringwraiths attack Frodo at the ford of Rivendell. For the voice talent, Bakshi hired John Hurt (The Naked Civil Servant, I, Claudius) to play Aragorn while Anthony Daniels (Star Wars’ C-3PO) voiced Legolas. Other voices were provided by veteran British TV actors including Christopher Guard (Secret Army) as Frodo, William Squire (Callan) as Gandalf, Michael Scholes (Rumpole of the Bailey) as Sam and Peter Woodthorpe (Z Cars) as Gollum. Once the film was completed an exhausted Bakshi was forced to deal with the consequences of a decision that would prove both controversial and damaging to the film: UA decided to drop the ‘part one’ tag from the title. Believing that no one would pay to see ‘half’ a film UA refused to back down despite strong protestations from Bakshi, who believed fans would feel cheated if they thought they were paying to see the whole of The Lord of the Rings story and saw only the first half. He was proved right – although the film did good business at the box office, grossing over $30m ($100m when adjusted for inflation) – many who paid to see it were angered by the ‘deception’. And then, to make matters worse, UA dropped the planned sequel leaving fans of the first film unable to see the completed story, and a jaded Bakshi vowing never again to work on an film that wasn’t entirely his own. After its initial cinema run the film faded from sight but didn’t disappear from memory – I remember being fascinated by the film in the early ’80s as I’d read so much about it in magazines, and I couldn’t wait to see the film for myself. But waiting was all I could do. Remember, back then home video was still in it’s infancy so the only way you could see an old film was to wait for it to be shown on TV (and as far as I can remember LOTR wasn’t broadcast on British TV until the early ’90s), or hope that a local cinema would revive it. Luckily for me the Odeon Queensway, located in Birmingham’s city centre, did just that and showed the film for a couple of mid-week afternoons in the summer of 1985, finally giving me the chance to see it on the big screen (I also remember that I was the only one in the cinema, the first and only time that’s ever happened). As I sat there in that dark auditorium waiting for the film to start, I wondered if it would match my expectations – I needn’t have worried: I thought it was terrific. Having been raised on a diet of cheap TV cartoons and saccharine Disney movies Bakshi’s film felt like a breath of fresh air. 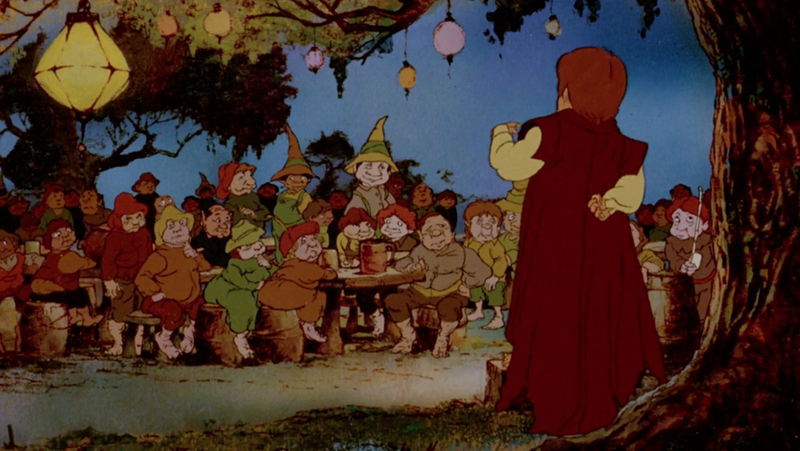 The rotoscoping effect (which I’ll readily admit isn’t to everyone’s taste) really did give the movie a realistic and, at the same time, surreal feel – although mixing the effect with traditional cell animation in the same shot was a little jarring, such as the scenes at The Prancing Pony inn. The film also packed a great deal of Tolkien’s story into its 133 minute runtime, with most of the major events from The Fellowship Of The Ring, and large parts of The Two Towers being depicted. Granted, like The Hobbit TV special a year earlier, the film rattles along at a pace that doesn’t allow for much characterisation but it’s a satisfying film none the less. I tend to regard Tolkien’s work as fantasy with a small ‘f’ as his somewhat heavy literary style offsets the more fanciful elements of the story. However, Bakshi set out to make a Fantasy film with a capital ‘F’, a larger than life epic, and on the whole he succeeds – I certainly remember it being a quick two and a quarter hours. I also remember being greatly impressed by the painted backgrounds. 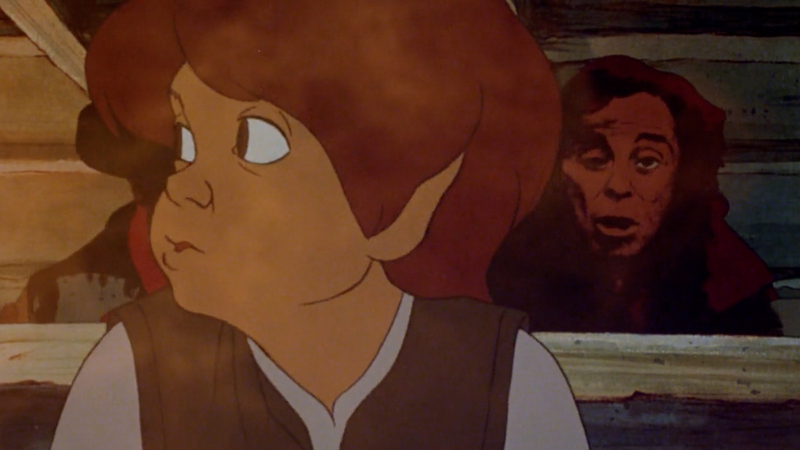 The brisk brush strokes felt very reminiscent of paperback cover artist Frank Frazetta‘s style of painting (he and Bakshi would eventually collaborate on the film Fire and Ice in 1983), and I liked how the backgrounds became more expressive and abstract the further Frodo and Sam journeyed into Mordor. I also liked the analogue optical effects, especially for the ford of Rivendell sequence, which has a dramatic, expressionistic feel. 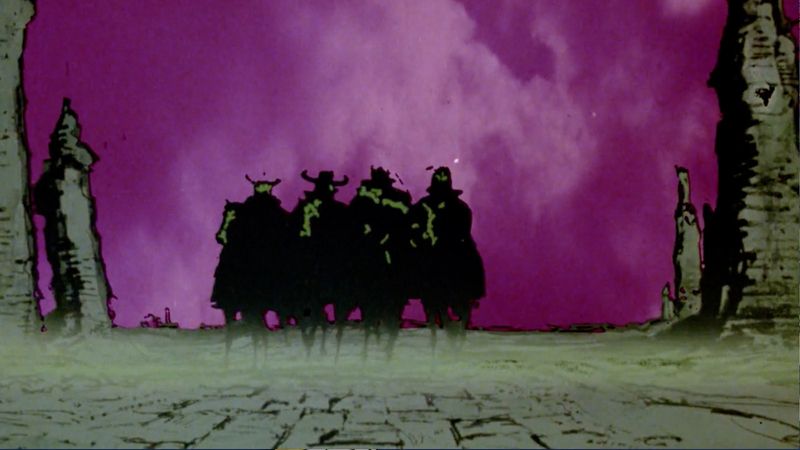 It was unusual to see effects like that used in an animated film. Leonard Rosenman’s score for the film also impressed me. Granted it’s not as nuanced or subtle as Howard Shore’s score for the Peter Jackson adaption but I liked it, particularly the opening theme/march. he gave us the legend that will live forever in our minds. powerful than a thousand realities. Now that’s how you sell a film! Since it’s initial release the film has gone on to enjoy cult status over the years, with Peter Jackson counting himself amongst its fans as well as many others, and the film is readily available on DVD and Blu-ray. I watched it again recently in preparation for writing this article and found that it has lost little of its magic over the 25 years since I first saw it in that deserted cinema. Once it was announced that a sequel to The Lord of The Rings would not be forthcoming, fans probably thought they’d never see a cinematic ending to the story. But in 1980 the production team behind The Hobbit TV special returned to Middle-earth to complete the final chapter of the story. Rankin/Bass Productions’ The Return of the King is up next.